All the usual stalls and side shows. The first half of the summer term ended on a high note with sunshine for sports day and record takings at the May Fayre. 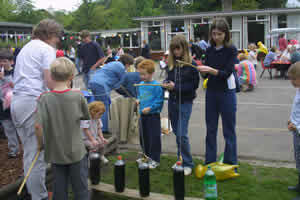 Organised expertly by FOLS, aided and abetted by many parents and villagers the four-hour event saw more than six hundred people through the gate and raised nearly three and a half thousand pounds after expenses. A great deal of effort was made to publicise the event, with posters even springing up around Andover and FOLs have been well rewarded. In addition to the usual games, tombola, plant stall, face painting etc, the entertainment in the arena proved very popular especially with the youngsters. And it didnt rain!! Which is more than can be said for the Tag Rugby Tournament organised by Hampshire Police at Overton earlier in the month. The persistent wet weather had turned the ground into a quagmire making playing a little too much like the real thing. That did not deter the year 3 and 4 mixed team though. They won through the round robin stage, quarter and semi-finals to face Overton school in the final. Longparish were beaten in the end, 6 4, but had played brilliantly to get so far. The year 5 and 6 team narrowly missed the quarterfinal. Both teams were invited to the County finals at the end of May  a tremendous performance. The year five and six football team proved even more successful, winning the Andover Rural Schools Tournament at the Charlton Leisure Centre where they were presented with the winners medals. Many congratulations to the team and their coaches. On the music front, the children thoroughly enjoyed a recorder workshop led by Mr Glyn Evans of the Hampshire Music Service, as part of their preparation for a music festival at the beginning of July.